When I have an unbearably jam-packed day, I look for an edible I can trust to deliver a focused, long-lasting high that provides relaxation without the drowsiness. Time and time again I turn to a trusted brand like Cheeba Chews and their 100mg 1:1 THC:CBD Chocolate Taffy (around $20) to get me through a long day. How to describe Cheeba Chews? Classic. Iconic even. For nearly 10 years, the brand has worked to cement its status as a familiar and trusted favorite. Their time-tested experience produces consistently tasty and beneficial products you can trust to deliver a familiar high every time. Find their products in most legal cannabis dispensaries in California, Colorado and Nevada. 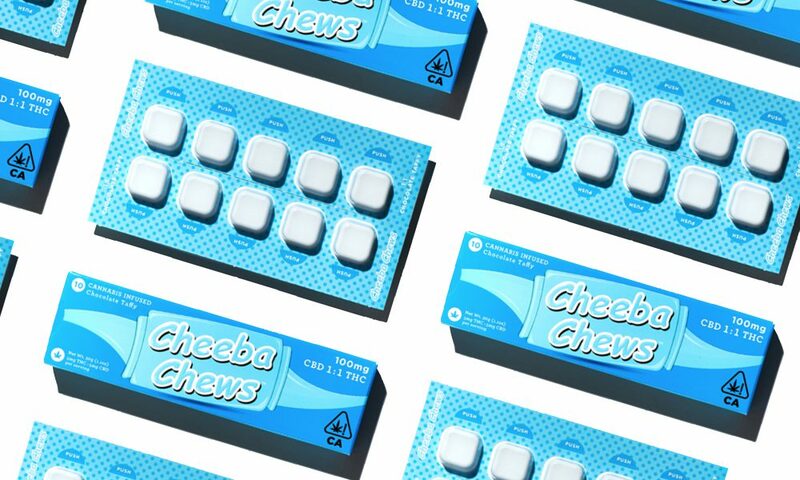 Cheeba Chews Chocolate Taffy comes in a rectangular, baby blue package. Inside are 10 individual blister-packed 10mg square pieces, each dosed with 5mg of THC and 5mg of CBD. This even ratio provides a perfectly balanced high, relaxing the mind and spirit while providing enough energy and focus to face a busy day head-on. This cannabis-infused taffy isn’t the most unique edible available, but what it lacks in creativity it makes up for in nostalgia and consistency. Each chewy, sticky bite reminds me of the saltwater chocolate taffy I bought as a kid on family vacations by the beach, enjoying them on the sand as the waves glided in and out – only with a slight cannabis flavor. These days I’m typically not relaxing by the Pacific when I eat Cheeba Chews (I’m sorry to say), but their texture, chocolatey flavor and consistent high leave me similarly relaxed for 2-6 hours. The new compliant packaging is a bit bulkier and tougher than the old medical chews. I had some trouble getting the taffies out of their plastic pouches so they’re truly child-proof. If you suffer from arthritis or other hand pain, you’ll need someone to open them. While Cheeba Chews enjoys the trust of the cannabis community, they tend to lack transparency when it comes to lab testing. Their website says their products are lab tested, yet the lab results, strain breakdown and cannabis source isn’t readily available on the packaging. The brand would benefit from offering more transparency on their lab test results, sourcing of plant material, and manufacturing technique. Until then, I’ll rely on the consistent results I get from this balanced 100mg taffy to form an opinion. The classic logo ensures an effective cannabis candy experience. One bite into the sticky, slightly chewy 1:1 square and you know what to expect: Tootsie Roll taste and a relaxed-but-functional experience. The new packaging required excessive effort to unwrap each individual child-proof packet, making it a hassle to dose in larger amounts. But if you’re into microdosing, this isn’t an issue. At 10 milligrams of balanced THC and CBD per piece, I ate the whole pack as a post-dinner treat, which was tough. It was a nice cap-off to my chicken stir-fry and helped digest that broccoli and bok choy without bloating. The taffy’s potency and effectiveness were exactly as I expected from Cheeba Chews – enjoyably chill-but-focused for body and mind. I felt comfortable and content getting work done without feeling lethargic; I didn’t fidget and wasn’t distracted by the noise outside my window on this surprisingly cool summer evening. With a $22 price tag, this is more than I’d like to spend on an edible – especially since Korova cookies are almost double the CBD and THC, only two dollars more and just as effective. Still, I know Cheeba Chews is a trustworthy brand backed by consistency and effectiveness, so I’ll continue to fork over 22 bones for more chews. You win, Cheeba Chews. Touché. While the box protects your chews well and has pleasing graphics, it’s far too big and bulky for the product inside. New compliant packaging is about six inches long and an inch deep, too bulky to stuff in your pocket. Child-resistant cardboard that covers the blister pack allows you to break down into longer segments, but it’s still awkward. Iconic logo and polka dot background make me know it’s a brand I can trust. Label includes net weight, amount of servings, THC: CBD content and cannabinoid content. List of ingredients along with nutrition information, yet no lab results. Includes a tip: pop these in the freezer for 2 minutes if the taffy is too soft to help get them out of the package. If the packaging included where this product was sourced, how it was sourced and the strains it came from, I’d give this a 5. Easier than it used to be to dose (for someone who doses in 5 mg increments). Childproofing makes it tough to open and requires more energy and finger strength. Consuming the entire Cheeba Chew out of the package at once is tricky and frustrating. Draws unwanted attention when you’re struggling to open the package. “Chocolate Taffy” chews taste like tootsie rolls. Has hints of cannabis flavor. Ideal if you’re a Tootsie Roll fan (I am not). Eventually melts in your mouth. It might get stuck in your teeth, but not irritating. Stays true to taffy texture. Makes me relaxed yet functional with equal parts CBD to THC. I ate the whole package (50mg THC and 50mg CBD), which was the perfect post-dinner treat. Chill but focused, I got stuff done without feeling restless or uneasy. Mimicking a tootsie roll, there aren’t many ways you can incorporate these into a meal. Try serving them on a toothpick as a post-dinner treat. Over the years, Cheeba Chews have been consistent in their flavor, consistency and effectiveness. Other brands like Korova have more cannabis content for almost the same price. Can charge more due to their trusted name backed by quality. If you need a reliable, balanced edible from a reputable brand to stay focused and active, this 1:1 THC:CBD taffy does it. You might find the childproof blister packaging a pain to open, especially if you have a higher tolerance and need the full 50mg THC and 50mg CBD for relief. While you can’t go wrong with its mix of Tootsie Roll flavor and slight cannabis taste, other brands provide more complex flavor and a bit more THC and CBD content for almost the identical cost. Ready to try Cheeba Chews’ 1:1 CBD: THC chocolate taffy? Click here and enter your address to find out if Nugg Club can deliver to your doorstep!